One of the things I love most about visiting with other comedians and motivational speakers is hearing stories about what went wrong. And trust me, a lot goes wrong. And often it is very funny… if you’re willing to let the pain subside. Case in point is my Utah speaker pal, Doug Nielsen. At the recent convention of the National Speakers Association in San Diego, California, Doug told me about a speaking event where he was stung by a wasp. Without any warning or provocation. Yeah, on his lip. How funny is that! He apparently was working on stage when a wasp pretty much dive-bombed him and stung him on the lip. He is a pro, so he pretty much ignored it and kept with the Show Must Go On attitude. He kept working, ignoring the pain. But little by little the lip hurt more and more, and it started to swell. The bug, after all, got him on the soft tissue. I meet hundreds of people each year who ask me how to become a motivational or public speaker. And what cracks me up is that these good folks assume that this job is filled with glamor, ease, and joy. Many times that’s true. Many times this job is that and more. But more times than you’d EVER guess it’s exactly like this day with Doug Nielsen. It’s crazy. And as weird as it is, it isn’t entirely abnormal. But it is absolutely hilarious. 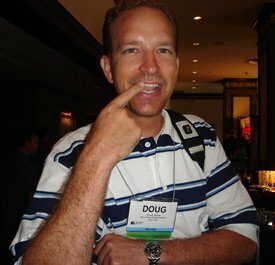 Thanks Doug… and your big fat lip! Got a bunch of wasps and wanna set them on me during one of my motivational speeches? Click here for more details. https://www.bradmontgomery.com/wp-content/uploads/2018/11/logo-1-495x198-1-300x120.png 0 0 admin https://www.bradmontgomery.com/wp-content/uploads/2018/11/logo-1-495x198-1-300x120.png admin2007-07-24 22:33:532007-07-24 22:33:53Motivational Speaker Attacked! How to Screw Up Your Next Corporate Meeting! Humor in the Workplace?